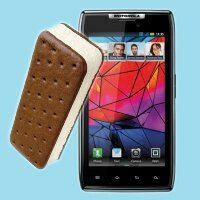 As Verizon Motorola DROID RAZR and DROID RAZR MAXX owners continue to relish with the recently available Android 4.0 Ice Cream Sandwich software update, those holding dearly onto the GSM version of the Motorola RAZR are wondering when it’ll be their turn. Interestingly, the wait isn’t long at all, as it seems as though Motorola is pushing out the update as we speak. Indeed, it’s a long time in the making, but nevertheless, GSM Motorola RAZR owners can experience all the wonders surrounding the new update. Specifically, owners in Asia are the first to report the beloved news of seeing the highly anticipated update – and we’re fairly certain it’s going to be spreading pretty quick at this point. Therefore, you might want to check for updates on your handset to see if it has arrived for you. Jul 01, 2012, 5:12 PM, by John V.
Jun 22, 2012, 9:33 AM, by Victor H.
If you’re still in the dark in what to expect with this new update, be sure to check out our hands-on with the new software for Verizon’s Motorola DROID RAZR MAXX. As a whole, the UI sports a cleaner look versus previous versions of Moto’s MOTOBLUR interface. Surely, there are going to be a lot of people excited by all of this, but the hot question that’s wandering around our head is when will the venerable smartphone see an Android 4.1 Jelly Bean update. So many news about this 'update', but there is no 'update' and wait for ics. Correction, there's no news for you. Unfortunately the world doesn't revolve around you. You do have the GSM version? and wich country? They're just now getting ICS out to them? ICS has been out since November. You'd think Motorola would step their game up now that they are owned by Google. ICS is already being outdated now that JB is rolling out. https://forums.motorola.com/pages/00add97d6c updated as of july 2! Razr gsm europe update moved to Q3 2012 wtf! what the fahoormaalijmahitiyeh Motorola!